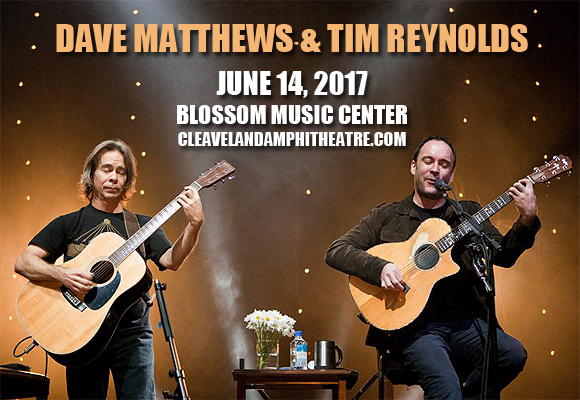 While The Dave Matthews Band are on hiatus, Grammy Award-winner Dave Matthews is teaming up with good friend, longtime collaborator and fellow Grammy-winner Tim Reynolds, for an intimate night of quality music! The pair comes to Blossom Music Center on Wednesday 14th June 2017 as part of an extensive tour that sees them traveling around the world together, playing acoustic shows that will no doubt thrill fans with hits from both of their incredible careers! South African-born American singer-songwriter, musician and actor Dave Matthews is best known for his role as lead vocalist, songwriter and guitarist for the Dave Matthews Band. A self taught musician that started playing guitar aged nine, Matthews first found success working with his band, which he formed in 1991, initially playing in small venues, frat houses and other college venues. Matthews' platinum-selling debut solo album, Some Devil, was released in 2003, generating the hit single “Gravedigger”, which won a Grammy Award for Best Male Rock Vocal Performance in 2004. Matthews also won a Grammy Award in 1997 for Best Rock Vocal Performance by a Duo or Group with "So Much to Say."